"Automotive Ethernet" can refer to any Ethernet-based networking scheme for in-vehicle electrical systems. It also serves as an umbrella term for both BroadR-Reach (or OPEN Alliance BroadR-Reach) and 100Base-T1 (the IEEE's 802.3bw-2015). 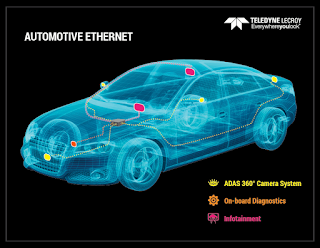 In either case, Automotive Ethernet is specifically tailored to enable faster data communication for in-vehicle networking. 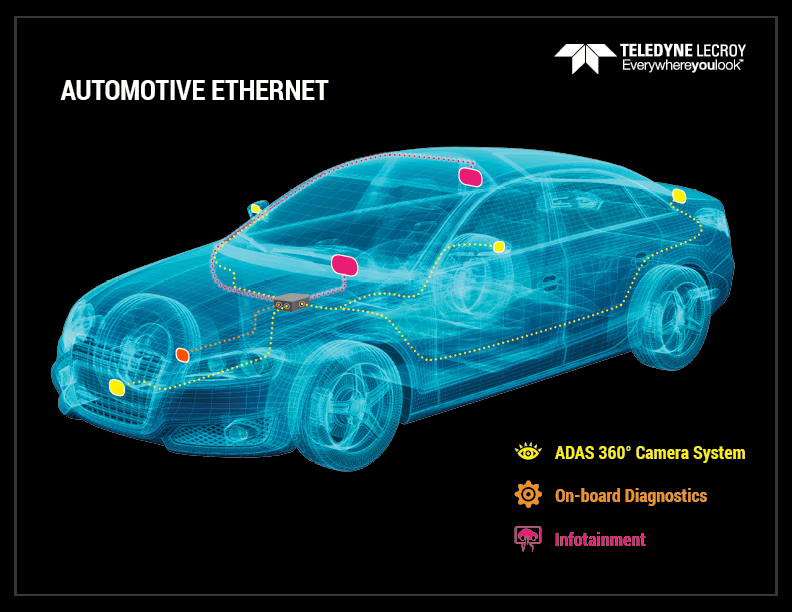 What are some of the industry trends that have driven the development of Automotive Ethernet? As mentioned above, there's the near-doubling of the amount of electronics within vehicles over the last decade or so. That doubling pertains to complexity as well as volume. Vehicles now routinely contain multiple cameras, on-board diagnostics, Advanced Driver Assistance Systems (ADAS), infotainment systems, and in-dash displays. With all of that hardware and software comes huge demand for bandwidth. Along with high bandwidth, today's vehicles are best served by networks with an open architecture that's scalable, future-proof, and can support multiple systems and devices. An in-vehicle network shouldn't impede getting the product to market. Cabling should be cost-effective and relatively lightweight. In addition, in-vehicle networks must meet tough industry standards with respect to temperature range, power consumption, and reliability. Many of the requirements sketched out above are beyond 100/1000Base-T, which has seen very limited use in automotive environments. That Ethernet variant is best suited for enterprise, business, and consumer applications. It offers a much longer reach, and is a shielded, four-pair cable that is too heavy for the automotive market. Indeed, some specific challenges drove requirements for Automotive Ethernet. For one, the operating environment is rather harsh, with temperatures ranging from -40°C to 85°C in the vehicle body and to 125°C in the chassis and power train. Mechanical constraints include acceleration of up to 4G in the body and cabin. Mechanical robustness is a must; we don't want cable connections failing every time we hit a pothole. In the next installment in this series, we'll look at little more closely at the BroadR-Reach protocol.